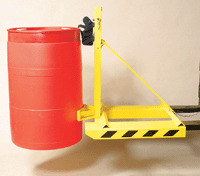 The LOM-LD-1 is a Low-Volume drum attachment that fits any forklift. The LOM-LD-1 is fully automatic and mechanical. Rugged all steel construction ensures many years of reliable service. Model LOM-LD-1 handles all rimmed steel, plastic and fiber drums.